Develop understanding and compassion for others local and abroad. Evaluate media according to what’s right rather than what’s popular. Apply God’s Word to issues such as telling the truth, obeying authority, and showing kindness when mistreated. 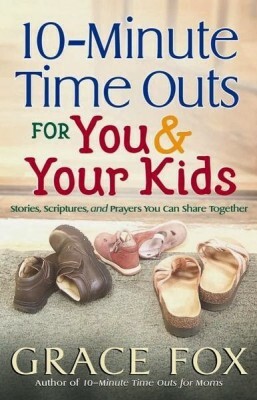 Here’s another “time-out” book from Grace Fox that is a must for every parent. As usual, it’s both biblical and practical! Grace Fox gets it. She knows kids, and she knows what they need. She has written material that both kids and their parents will love as they learn together how best to honor God and to walk in His ways. 10-Minute Time Outs for You and Your Kids is a treasure chest packed with practical nuggets of wisdom for kids! I only wish Grace’s book was around when I was running family devotions for my kids! But praise God, I will have it on the shelf for my grandchildren! My 12-year-old son and I sat down to read one of the devotions from 10-Minute Time Outs for You and Your Kids. We loved them so much we read three! We laughed out loud, prayed together, and talked about how wonderful God is. Nathan said, “The stories are great, and I learned a lot about God. It was like going on a treasure hunt and finding gold.” How can a mom not love that? We’ve already set a date for a 10-minute time out tomorrow! I want to tell you how much our 13-year-old daughter and I love your devotional for parents and their kids. We’ve both been gleaning great stuff from it. My daughter has a special journal book in which she writes the verses from each of the devotions, so I know she looks forward to our special time together. Thanks for writing such a pertinent book. My kids used to hate bedtime. Now they can hardly wait because they look forward to these stories! When I interviewed you for that book a few months ago, I had no idea how it would impact my own life. I have a grandson who visits frequently. Each time he’s here, I read one of the stories to him and then use the discussion questions to talk about what we’ve read. I used to read the Scripture to him but that put him to sleep. Now he can hardly wait to read the devotionals and talk about what he’s learning.